Kobo BOGO sale is here! Just a few more days and THE FIRST WIFE'S SECRET will be here to haunt you! Right now it's up for pre-order on all e-reader platforms! Don't hesitate to pick this one up. It will be an Amazon exclusive come release day THIS THURSDAY! This book grabs you and it does not let go. You won't want to miss it! And craving another 3:AM Kisses book? I've got one! 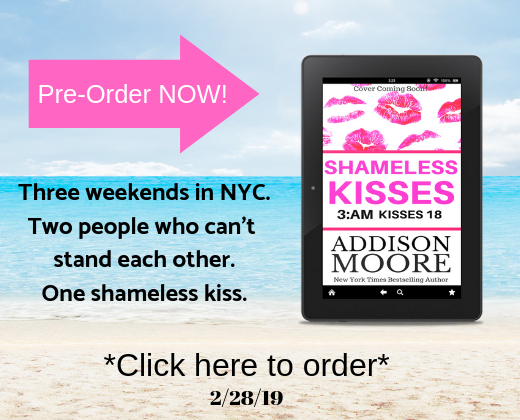 SHAMELESS KISSES drops 2/28/19 and the pre-order link is below! It is such a FUN book! You can't miss it. Scroll down for the Kobo BOGO sale info! I've got links! Kobo BOGO sale! Buy any one of the books above and get one FREE! At Kobo, this month only! CLICK HERE —> Kobo BOGO. Or check out other fabulous BOGO deals here! –> All BOGO! Beautiful Oblivion, Beautiful Illusions, Beautiful Elixir, Beautiful Deception, A Good Year for Heartbreak, Heartless,Wicked Heart, Stone Cold Heart.